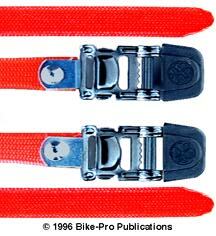 These have been known as Mountain Clips, but the day of the single strap carrier on a toe clip has long since passed, so these are for every rider. (They are thought to be manufactured by Westec Plastics Corp. of San Jose, California, who make the Specialized plastic bottle cages). These are for Road or Mountain bike use. 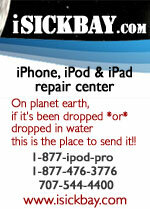 They are made of a DuPont material and are tough, resilient and flexible. The double strap carriers have a rib up the front to add support. They can be used with any type of toe strap. Black only, they come in small, medium and large with four 5mm by .8mm bolts, four matching nuts and eight washers as mounting hardware. The small clips weigh 43 grams per pair, the medium 45 grams and the large weigh 48 grams per pair, without hardware. The mounting hardware weighs 20 grams. 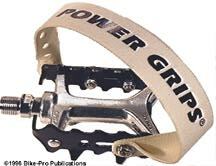 Power Grips eliminate the need for both toe clips and toe straps by replacing them with a single 1 1/4" wide piece of laminated fabric. Two pieces of durable cotton fabric are hot laminated over a thin, clear elastomeric polymer base. This lamination process gives body and stiffness to the strap so it holds it's shape. The piece is bolted in the place of toe clips, so it covers your foot from the inside rear, over the foot, and fastens to the outside front of your pedal. The rear fastening is simple enough, a 5mm by .8mm bolt with lock nut, bolts the folded fabric in the right hole usually used for reflector installation. The fabric is folded so it retains a smooth shape as it migrates over the foot. At the front there is a narrow steel U-bolt that is held by two more of the 5mm bolt sets. 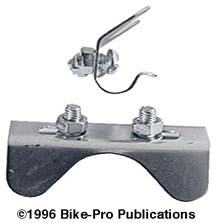 It's U-bolt nature permits the system to move laterally to adjust the system for the height your pedal and shoe. The front end of the fabric has 6 sets of holes spaced 1/2" on center apart. These holes permit you to size the length of the strap to your personal needs. 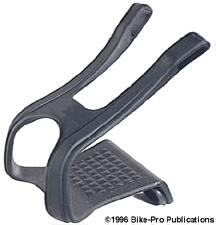 This strap end is bolted to the outside front of the pedal with a provided small bolt and lock nut. With the Power Grip on you slide your foot in the pedal, under the strap, and rotate your foot inward, which cinches you into the pedal. Release is by merely rotating your heel strap outward. They are easy to install and work with all but the most unusual non-cleated shoes. Power Grips are available in Blue, Black, Green, Lavender, Pink, Red and Yellow. A set of Power Grips and their matching hardware weigh 121 grams. 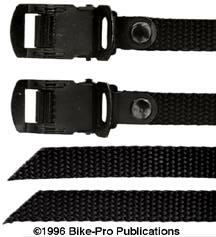 These are toe straps made in Taiwan, by Victor. The fine woven Nylon strap is 17 1/2 inches long, has a rounded tip, and both ends deep, heat seared to prevent the fabric from unraveling. The buckle is made of chrome plated steel, with spring loaded jaws to permit the cyclist to thread the toe strap and leave it in a fixed shape and position. The buckle will permit dynamic use of the strap, allowing a single finger using an outward movement to open and release the foot. A single tug at the end of the strap cinches your foot firmly in the toe clips, all made easy by a toothed roller. The end of the buckle is Black plastic encased to conform to the finger shape without actual abrasive metal contact. The strap and buckle are joined by a chromed steel fastening piece that allows buckle to swivel and is riveted firmly through the strap 1/2" behind the seared end. They are available in Blue, Black, Grey, Lavender, Red, and White. The pair weighs 56 grams.